I saw this on the Innovative, Banned, and Unique Racing Cars Facebook page, and it caught my attention like an unnoticed hand on a groin: a Messerschmitt KR200 microcar with a massive, brutal Hemi V8 engine crammed in it. Holy hell. In case you’re not familiar with the Messerschmitt microcar, it was one of the crop of post WWII microcars made so broke, beaten Germans would be able to start rebuilding their lives after WWII, much like the Isetta. The Messerschmitt was made by the famous airplane company, which may account for its distinctive, aircraft-like look: tandem seating, a plane-like canopy, all that. Non-car people may recognize it as Sam Lowry’s ‘personal transporter’ from the movie Brazil. Let’s get back to that picture, though. The Messerschmitt came with a 175 or 200cc engine that made, at best, about 10 HP. Oh, they did make a 500cc, four-wheeled sports version called the Tg500 or Tiger, and that beast made about 20 HP. But this. Holy crap. That Hemi they have shoved in the lengthened front of that car has to be good for 10x that, easy. I don’t know much about the Sherman-Alinson racing team, but what I can see I like very much. The Messerschmitt body is clearly on a new, much longer chassis, and the front end seems to be an early Beetle torsion-bar front axle. The open-hub, 5-lug wheels are definitely of-the-era VW. I’m not sure about the rear end, and looking at this thing, it seems like he driver would be shifting between their legs and there’d be a driveshaft spinning right there under the seat, which makes my testicles want to weep in sympathy. Submitted by Edmonton’s Darryl Weflen. 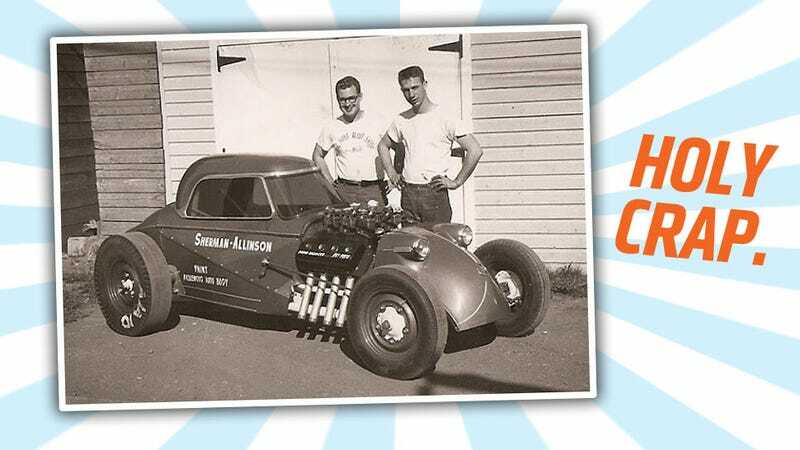 His dad was buddys with Tony Allison one part of the Allison and Sherman drag race team (Bill Sherman) who raced a Hemi-powered KR200 Messerschmitt in we think late 50s or early 60s ..problem is we don’t know what year KR200 it is...how fast it ever went or what years it raced. If anyone knows more about this gloriously bonkers car, I’d love to hear about it so, please, don’t be shy!